UNIT 4: CHEMICAL REACTIONS By Adam Yu and Charmaine Lai. 8 When a chemical reaction occurs in a closed system, the mass of the reactants equal the mass of the products. This is a statement of the LAW OF CONSERVATION OF MASS. A SYSTEM is the part of the universe that is being studied in a particular situation. 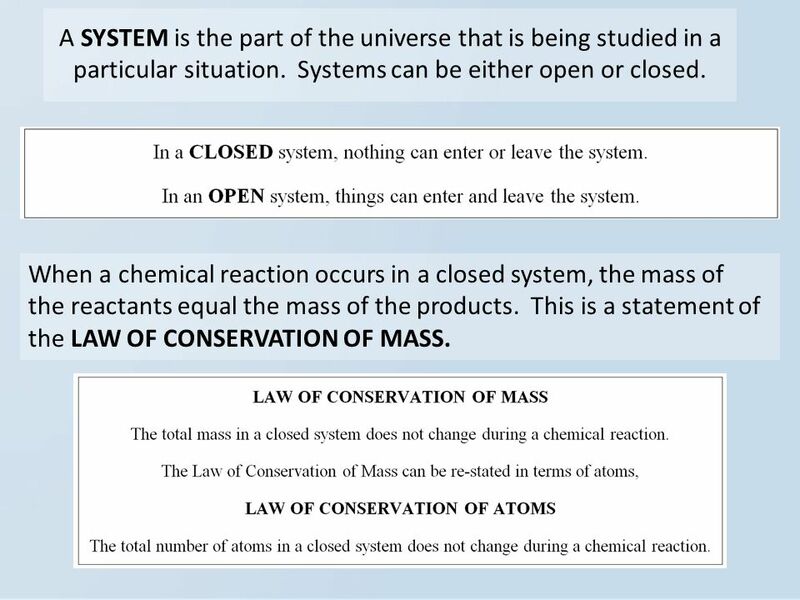 Systems can be either open or closed. 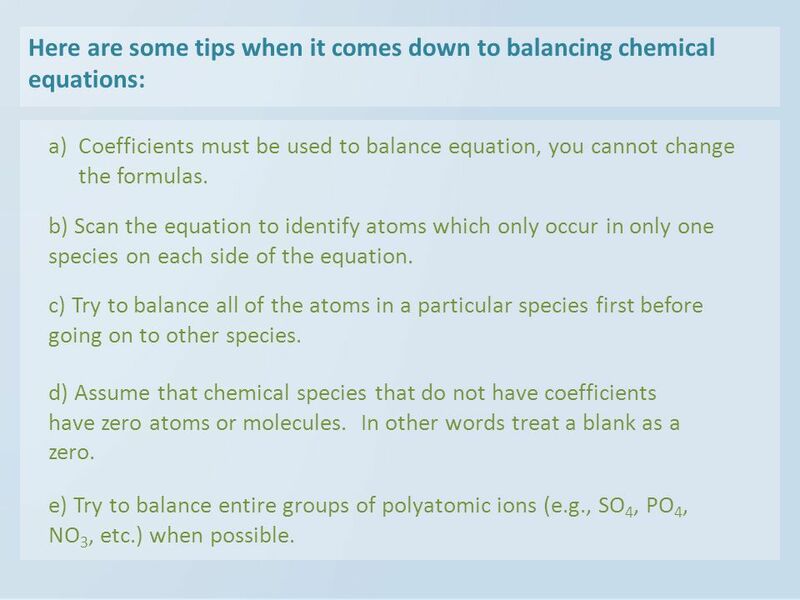 10 Here are some tips when it comes down to balancing chemical equations: a)Coefficients must be used to balance equation, you cannot change the formulas. b) Scan the equation to identify atoms which only occur in only one species on each side of the equation. 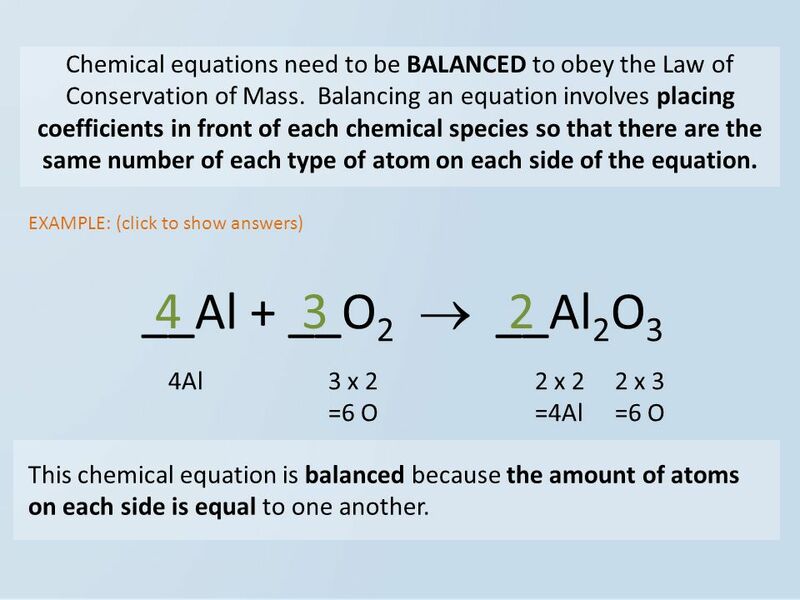 c) Try to balance all of the atoms in a particular species first before going on to other species. d) Assume that chemical species that do not have coefficients have zero atoms or molecules. In other words treat a blank as a zero. e) Try to balance entire groups of polyatomic ions (e.g., SO 4, PO 4, NO 3, etc.) when possible. 13 Molecules are held together by chemical bonds. 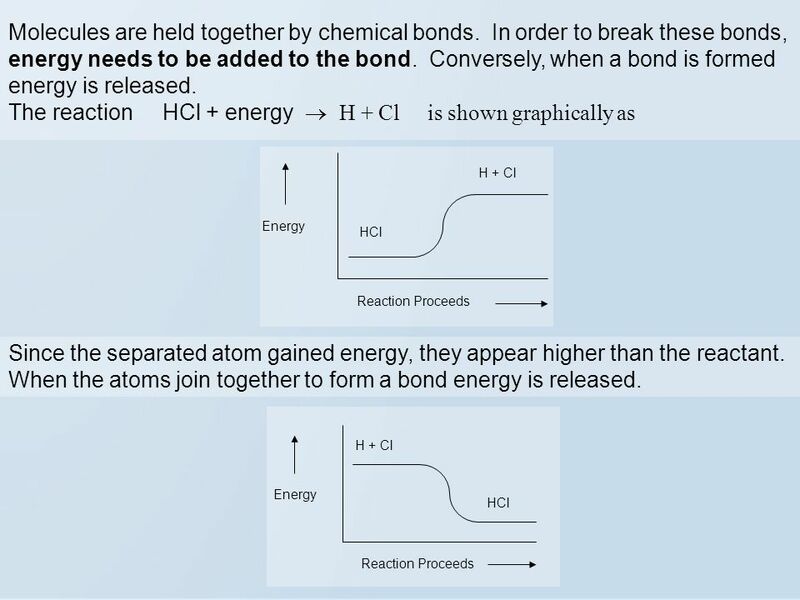 In order to break these bonds, energy needs to be added to the bond. Conversely, when a bond is formed energy is released. 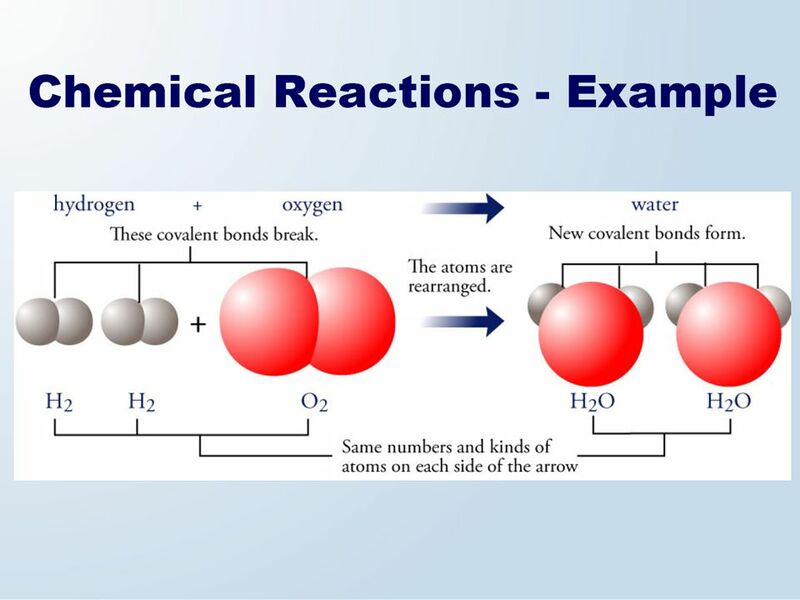 The reaction HCl + energy H + Cl is shown graphically as Energy Reaction Proceeds HCl H + Cl Energy Reaction Proceeds HCl H + Cl Since the separated atom gained energy, they appear higher than the reactant. When the atoms join together to form a bond energy is released. 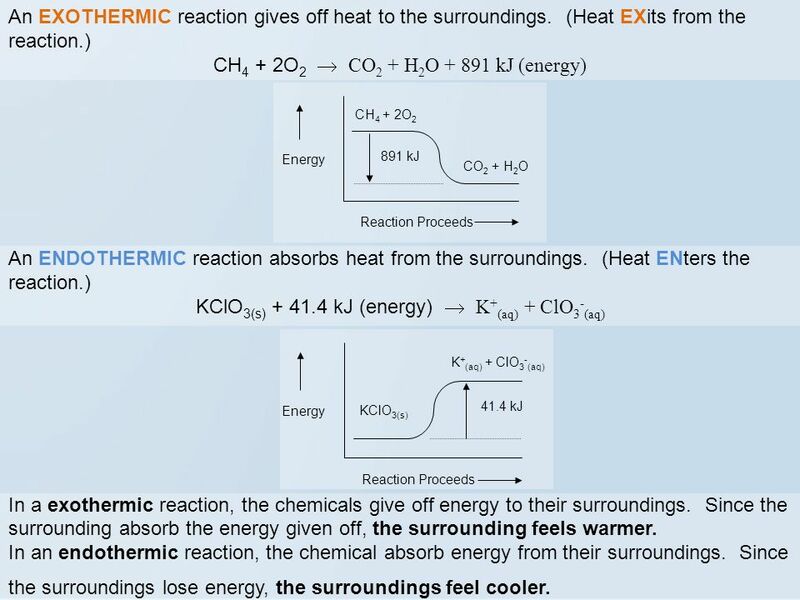 14 Energy Reaction Proceeds CO 2 + H 2 O CH 4 + 2O 2 891 kJ An EXOTHERMIC reaction gives off heat to the surroundings. (Heat EXits from the reaction.) CH 4 + 2O 2 CO 2 + H 2 O + 891 kJ (energy) An ENDOTHERMIC reaction absorbs heat from the surroundings. (Heat ENters the reaction.) KClO 3(s) + 41.4 kJ (energy) K + (aq) + ClO 3 - (aq) Energy Reaction Proceeds KClO 3(s) K + (aq) + ClO 3 - (aq) 41.4 kJ In a exothermic reaction, the chemicals give off energy to their surroundings. Since the surrounding absorb the energy given off, the surrounding feels warmer. In an endothermic reaction, the chemical absorb energy from their surroundings. Since the surroundings lose energy, the surroundings feel cooler. 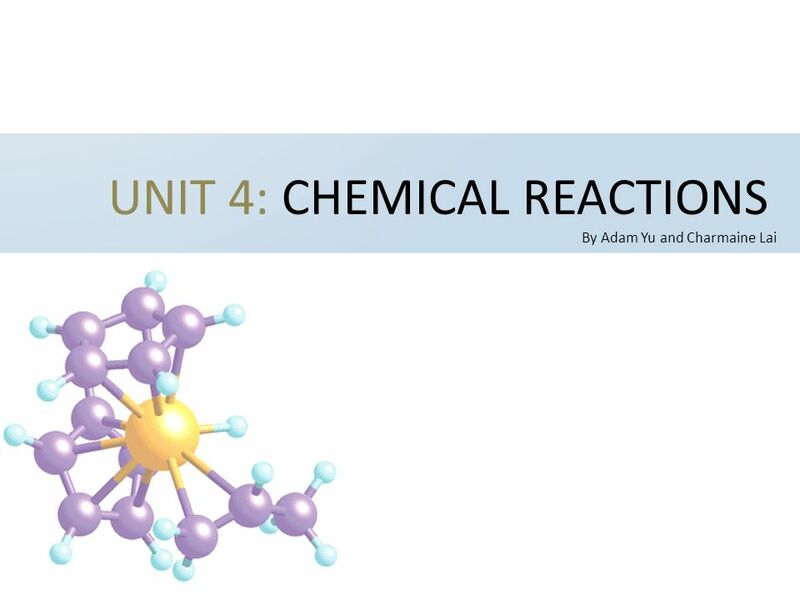 Download ppt "UNIT 4: CHEMICAL REACTIONS By Adam Yu and Charmaine Lai." Ch. 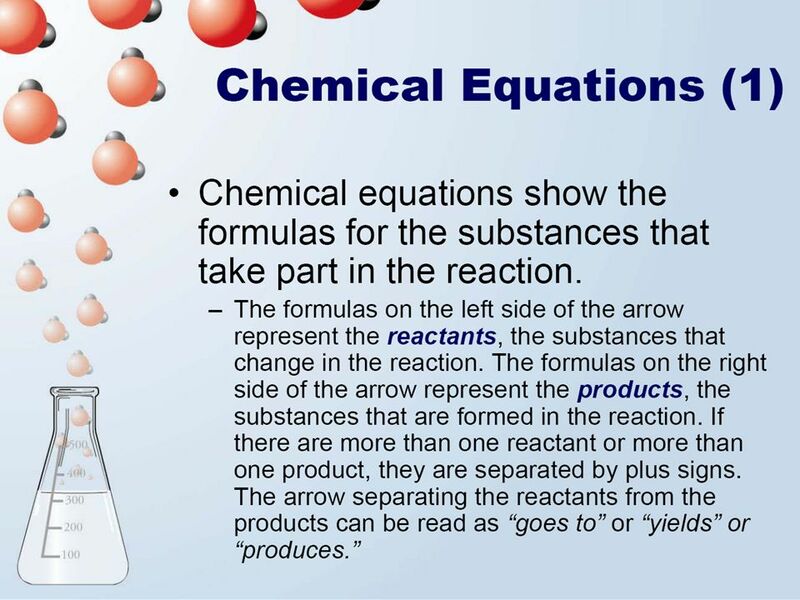 8 – Chemical Equations & Reactions Define a Chemical Reaction Comprised of symbols and formulas that represent the reactant & products of the chemical. 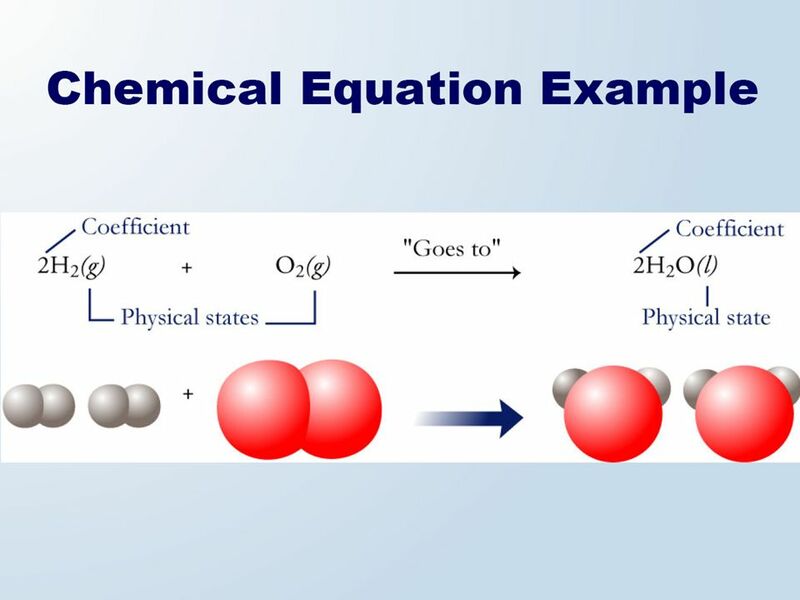 Balancing Equations Chemical reactions occur when bonds (between the electrons of atoms) are formed or broken Chemical reactions involve changes in the. Unit 4 (Day 1) Ms. Kondra & Mr. Olnhoff. 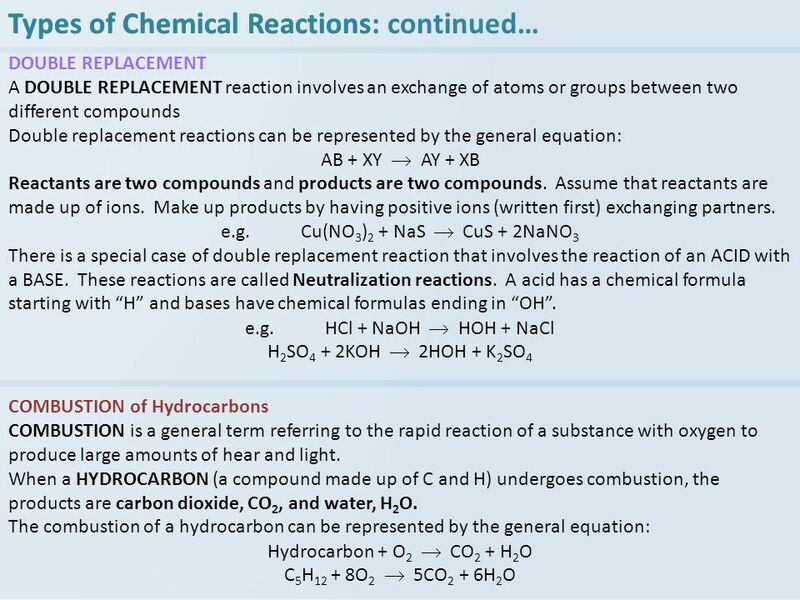  Statement conveying information about a chemical reaction. 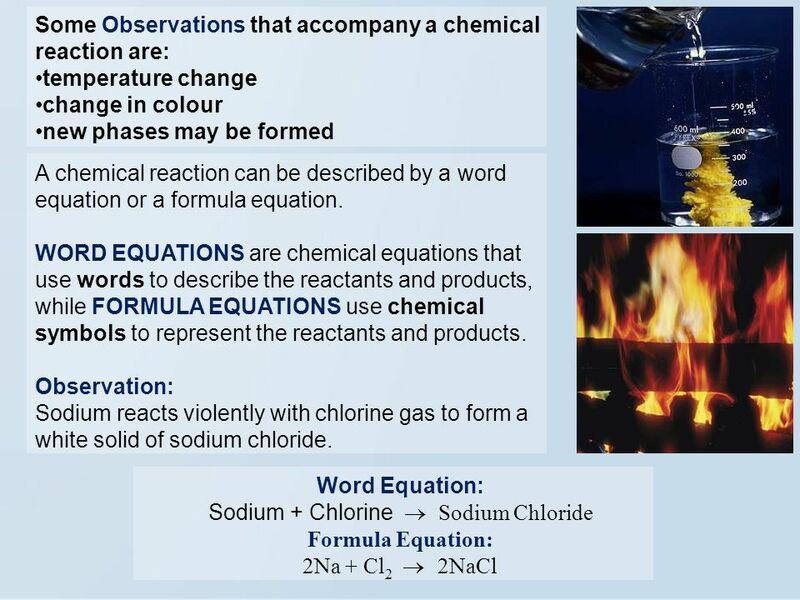  Two ways of describing chemical equations:  Word. Chemical Reactions Unit 7, Chapter 7 I. 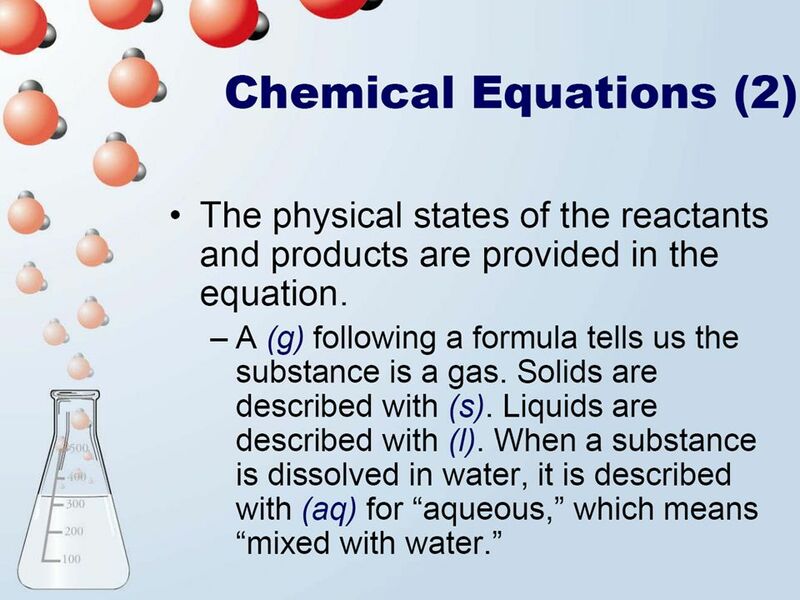 Chemical reaction: Occurs when one or more substances undergo a chemical and physical change producing one or. Chemical Reactions. Which of the following are examples of chemical change? Digestion Melting an ice cube Running a car Decomposition Dissolving sugar. 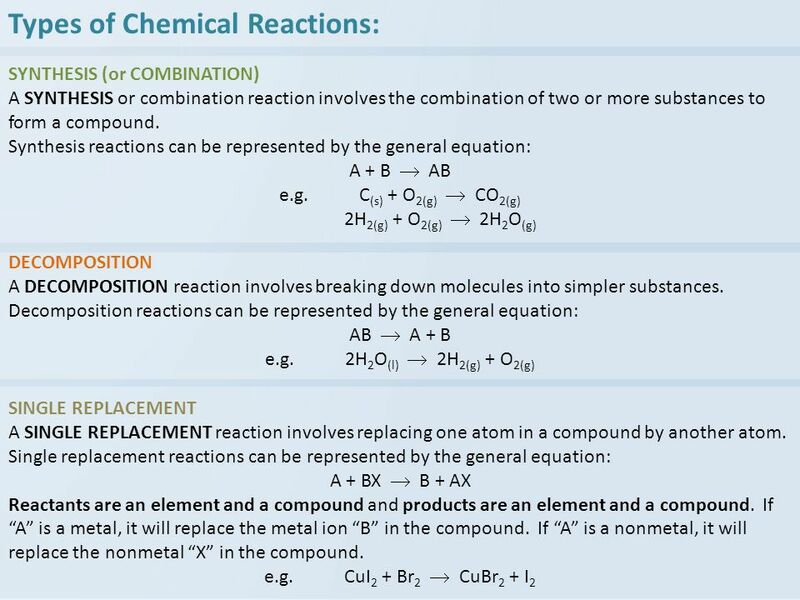 Chapter 8: Chemical Equations and Reactions. 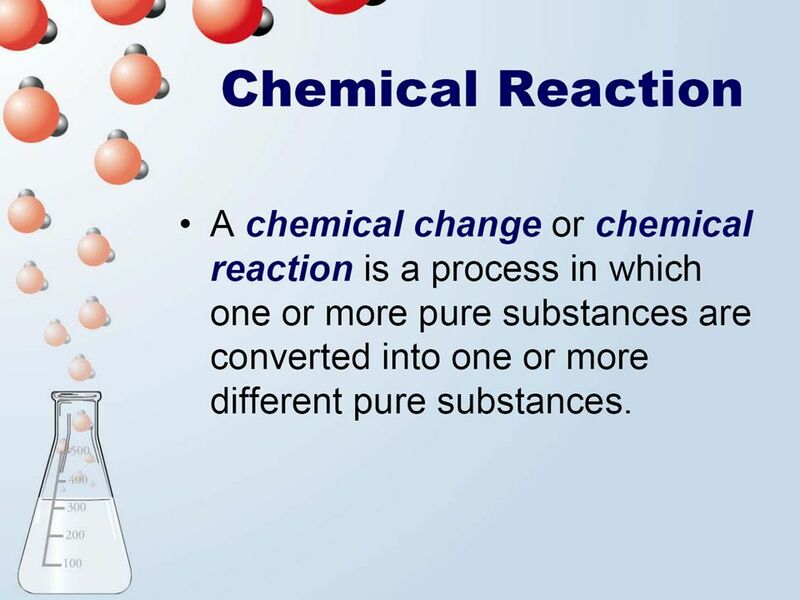 8.1 Describing Chemical Reactions a process in which 1 or more substances are converted into a NEW substance. Jeopardy ChemicalPhysicalFormulasEquations Chemistry Q $100 Q $200 Q $300 Q $400 Q $500 Q $100 Q $200 Q $300 Q $400 Q $500 Final Jeopardy.